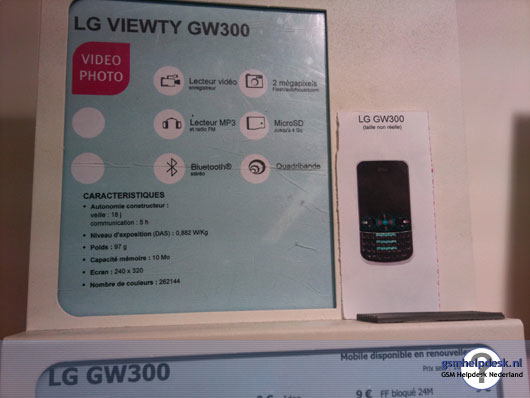 LG taking Viewty name way downmarket with GW300? When we hear "Viewty," we think expansive touchscreens and ample, high-capability cameras. LG might be a little over-excited to capitalize on the brand's name recognition, though, because that uninteresting GW300 we showed you a little a while back -- the low-end portrait QWERTY handset with a 2 megapixel cam, quadband EDGE, and a meek QVGA display -- has apparently been slapped with a Viewty badge and quietly released in France with nary a peep out of LG's press offices. As best as we can tell, the company figures customers will stroll into the store, see the phone, think to themselves "holy [expletive], I can get a Viewty for [some ridiculously small amount of euro]?" and plunk down the cash -- but given how the GW300 looks nothing like its brand siblings, we can't picture that happening. LG taking Viewty name way downmarket with GW300? originally appeared on Engadget Mobile on Sun, 30 Aug 2009 11:37:00 EST. Please see our terms for use of feeds.